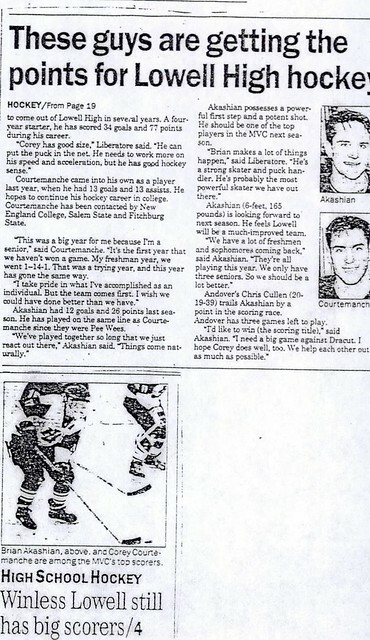 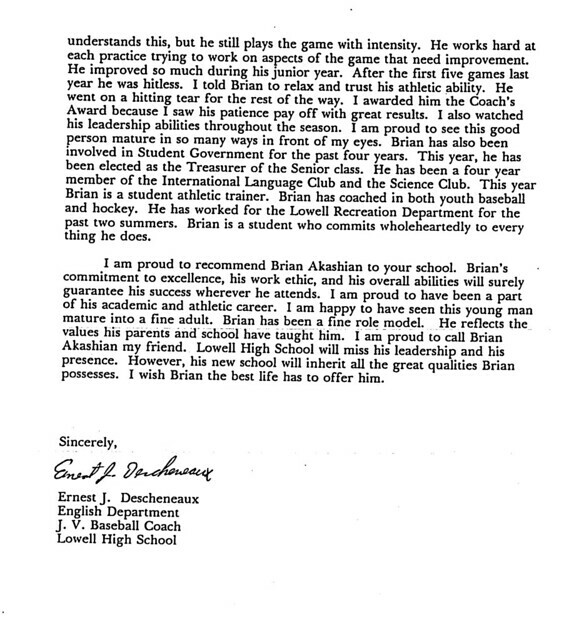 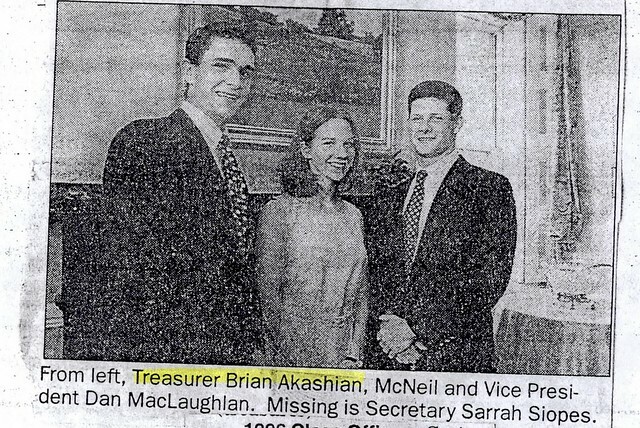 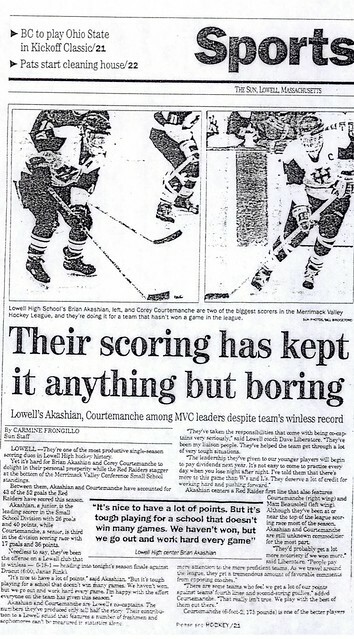 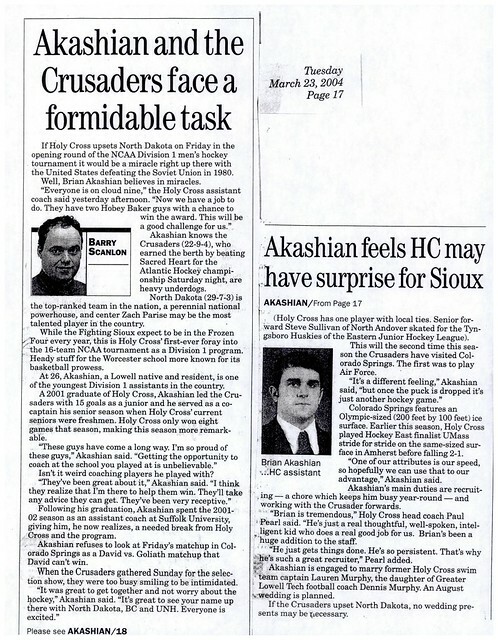 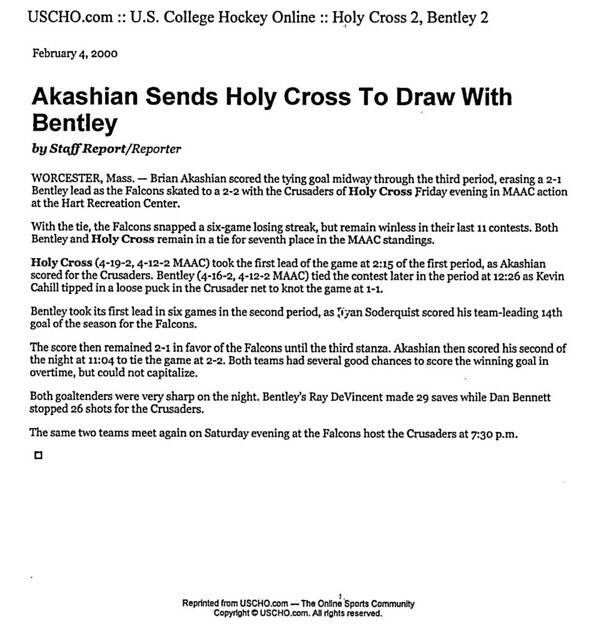 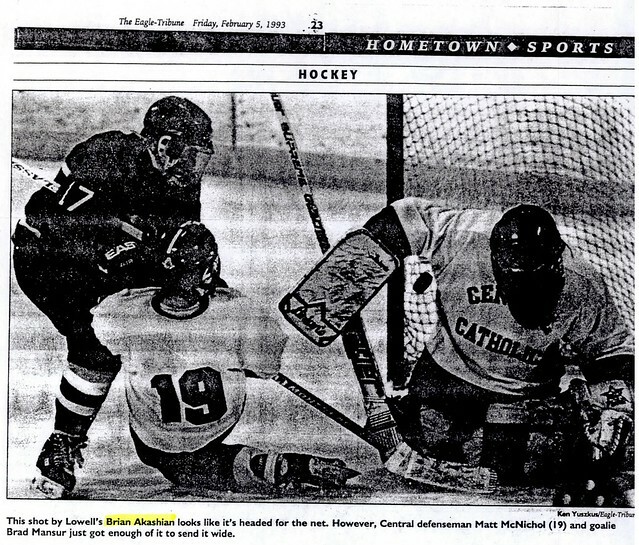 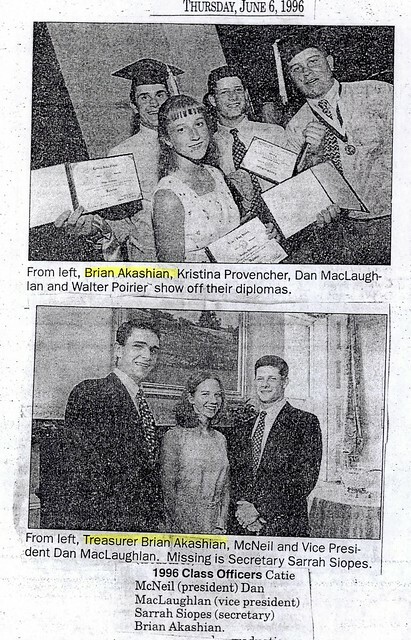 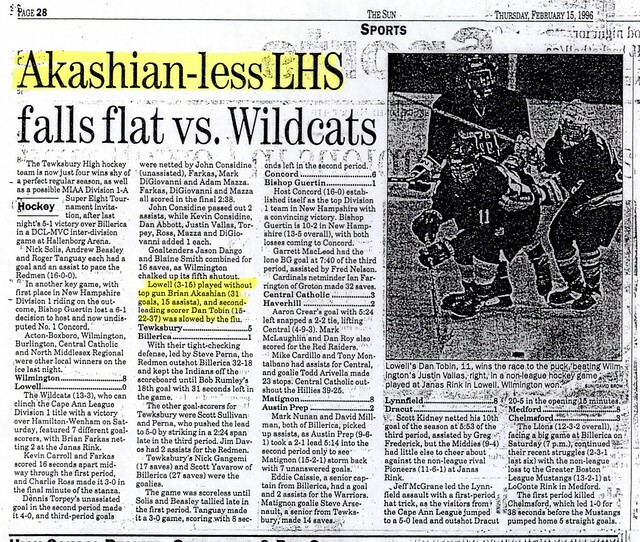 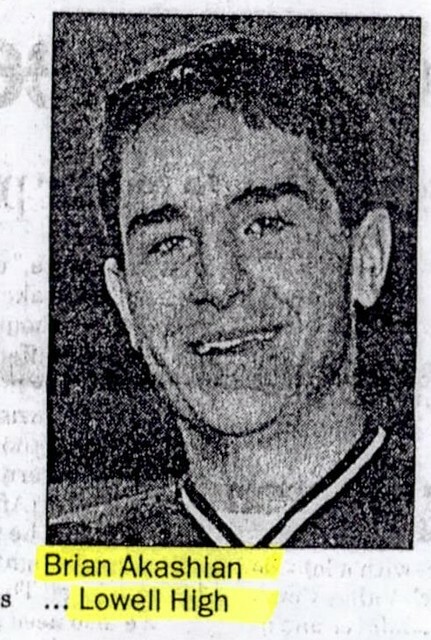 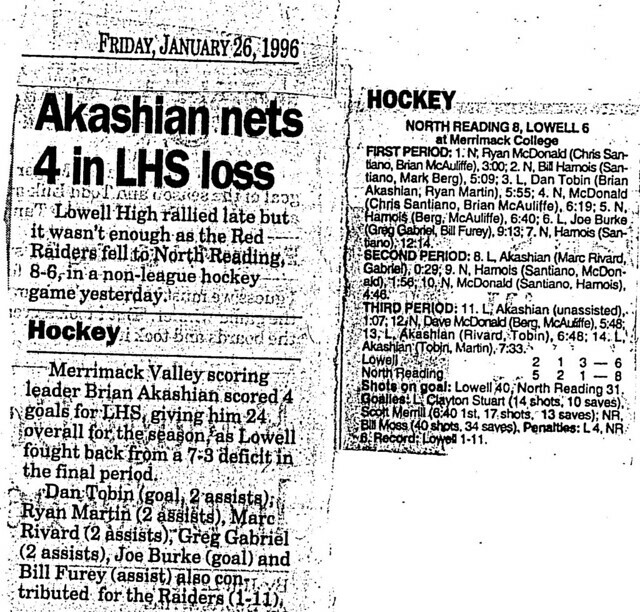 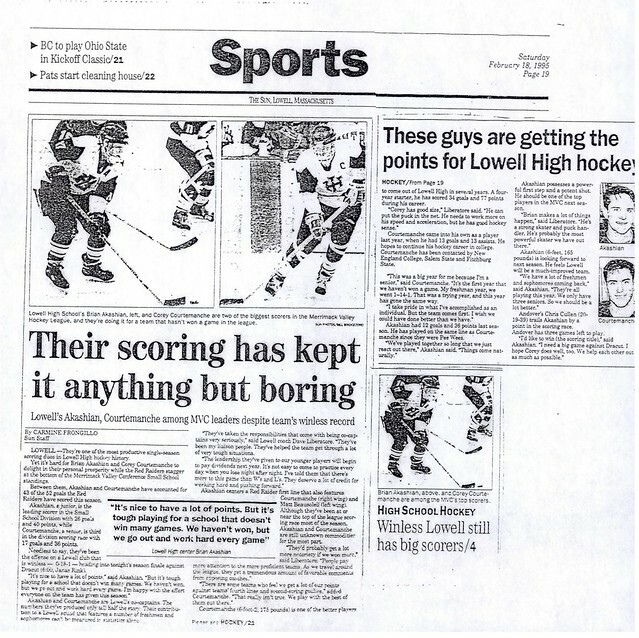 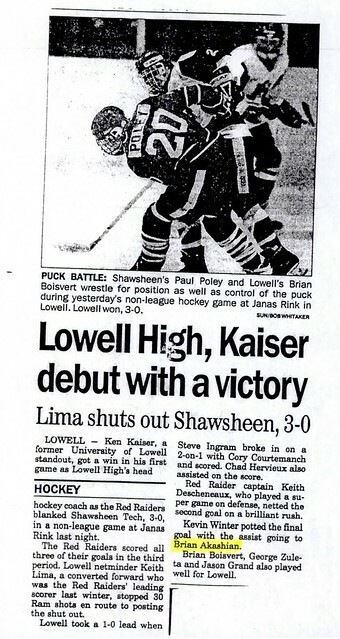 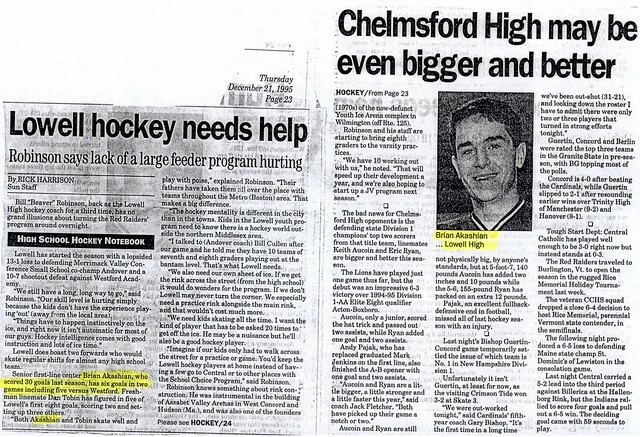 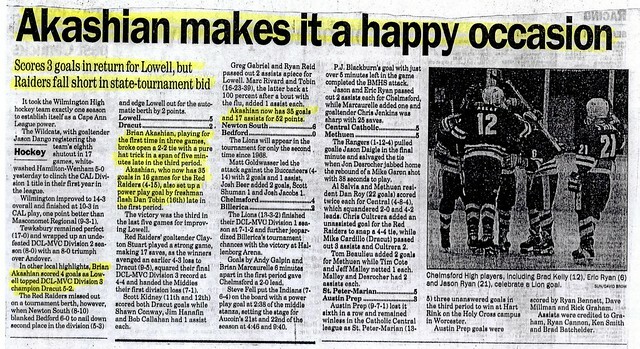 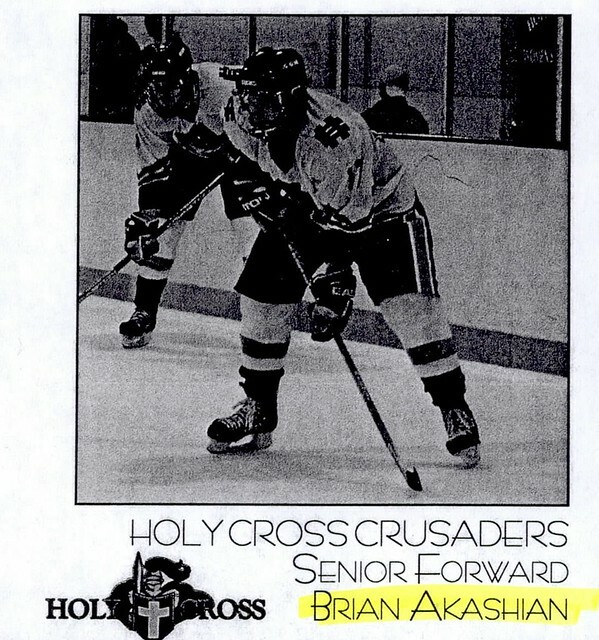 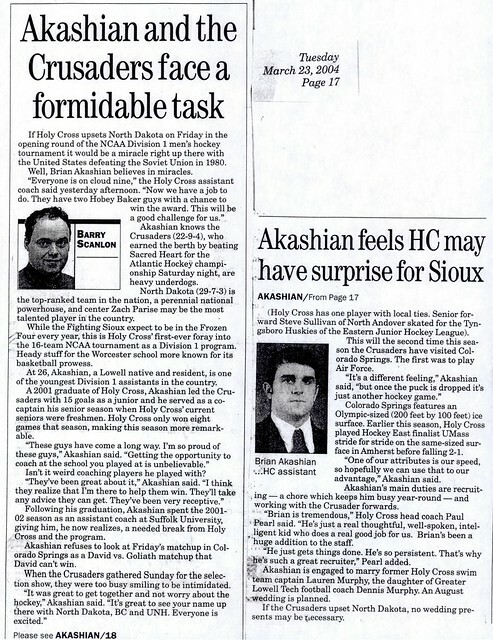 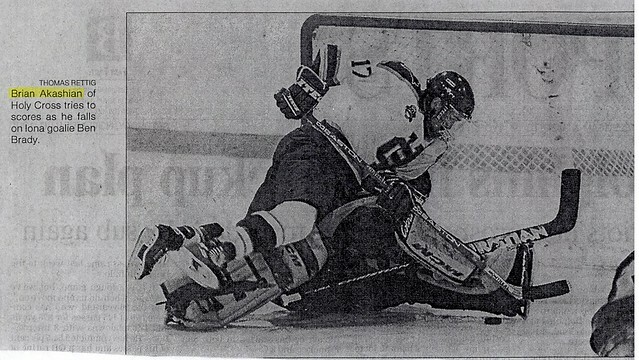 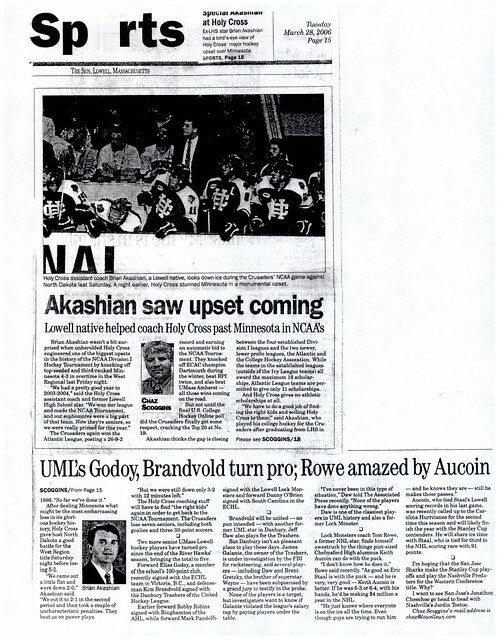 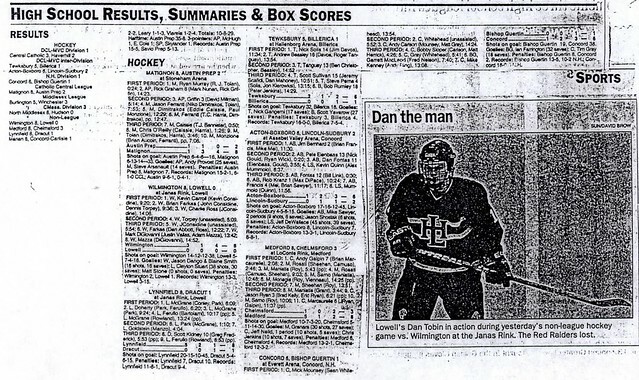 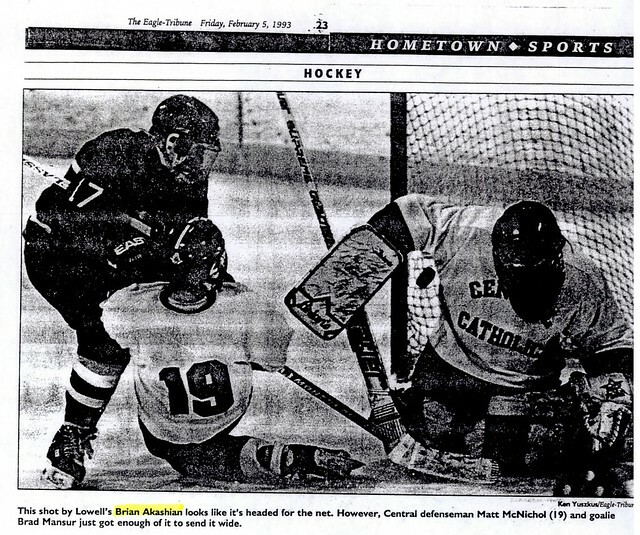 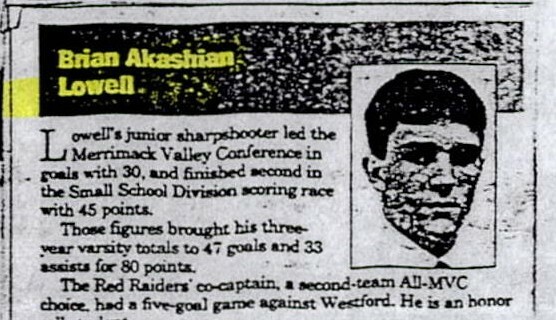 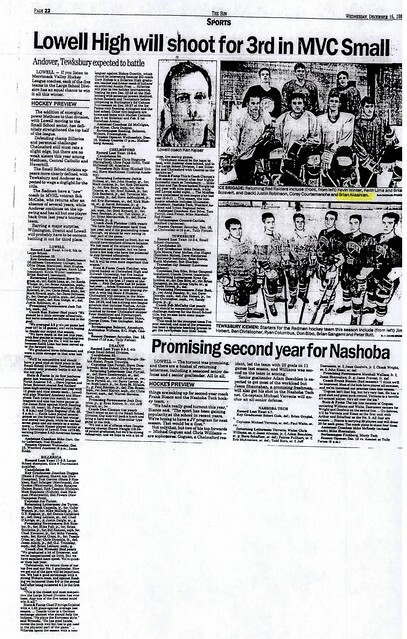 One of the most prolific scorers in the history of Lowell High Hockey, Brian Akashian’s stellar career bridged a time when the very existence of the program was in doubt to a period when Lowell High School developed into one of the premier hockey programs in Eastern Massachusetts. 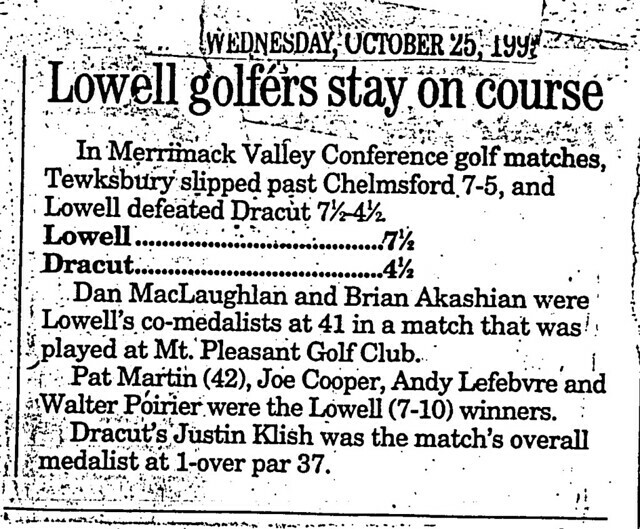 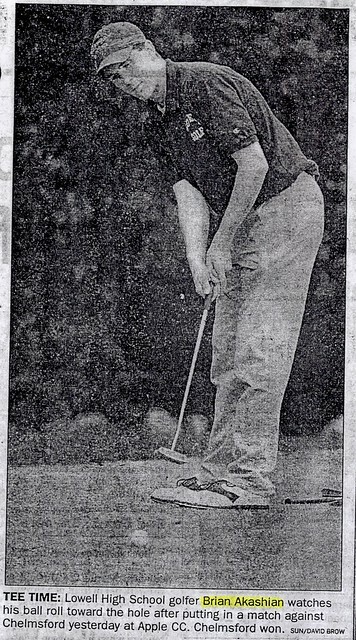 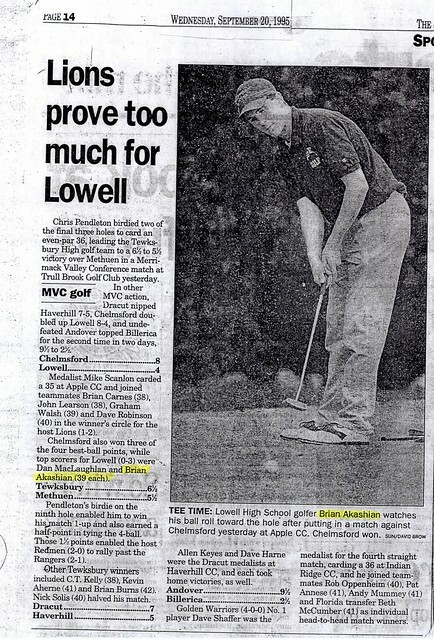 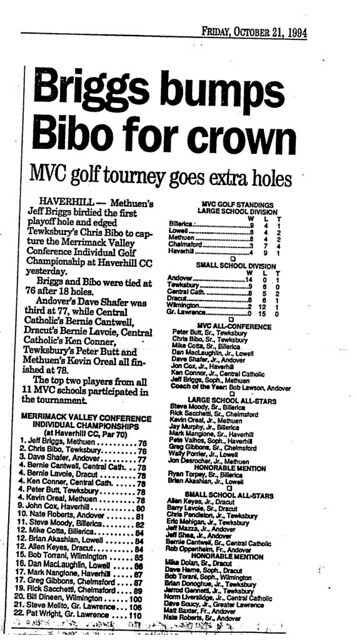 A gifted all-around athlete, Brian was a 2-time Merrimack Valley Conference All-Star as a member of the Red and Gray Golf team in 1994–1995. 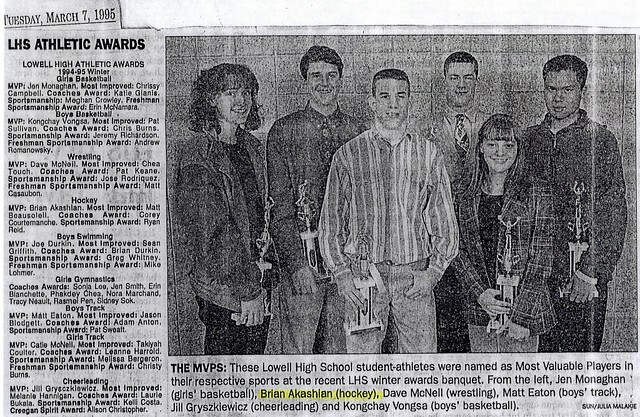 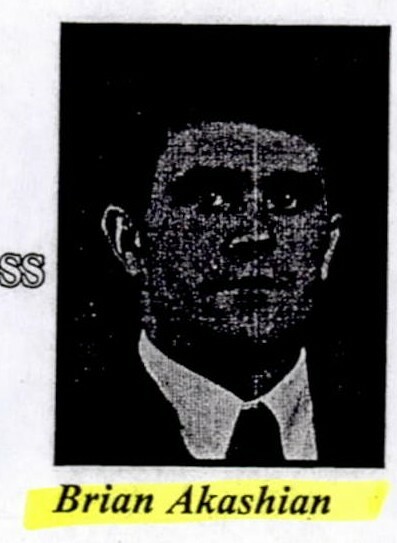 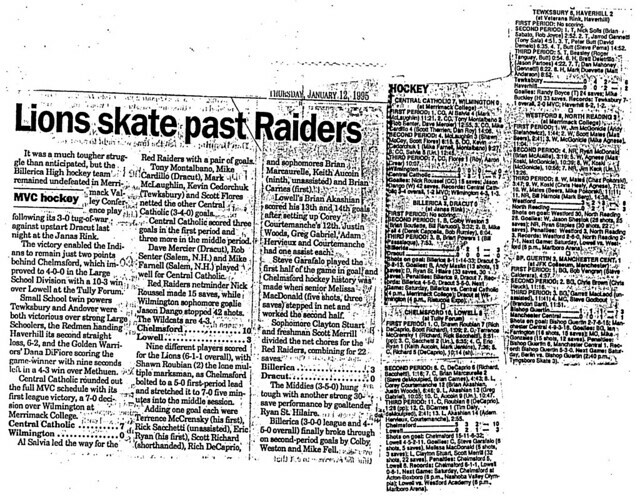 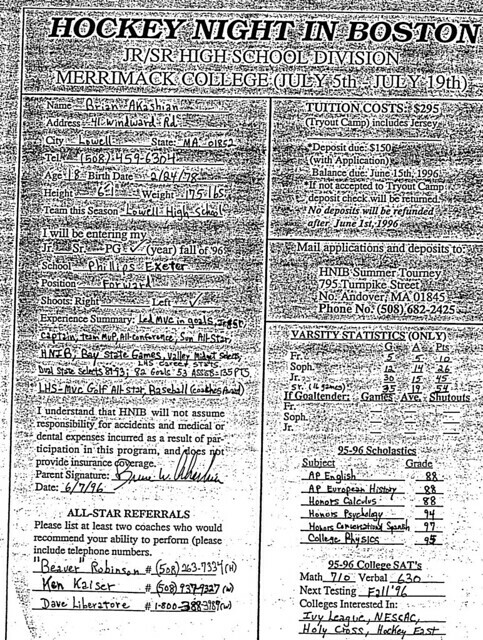 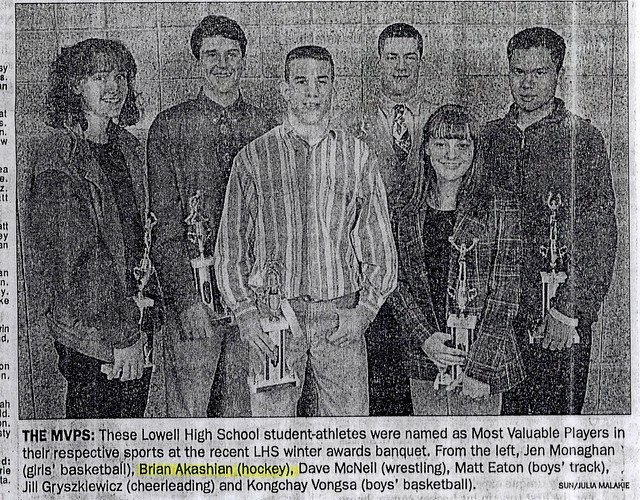 He also was a member of the Raider Baseball team, winning the Coaches’ Award in his junior season (1995). 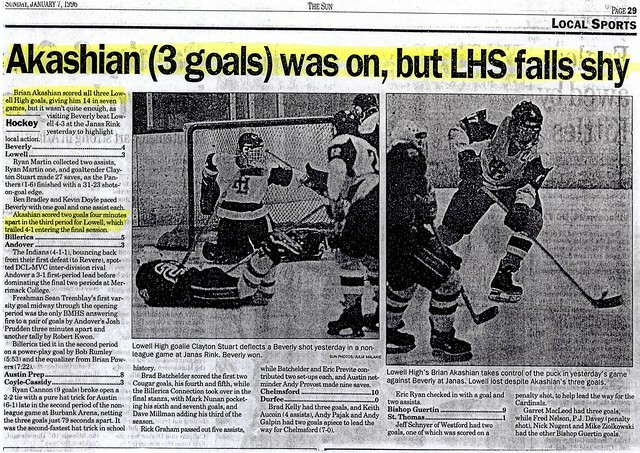 However, it was as a dynamic performer on the LHS Hockey team that Brian gained his place in the annals of Lowell High School athletics. 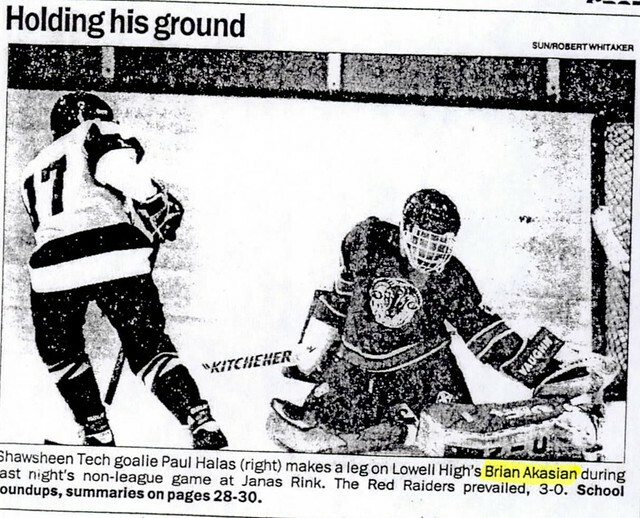 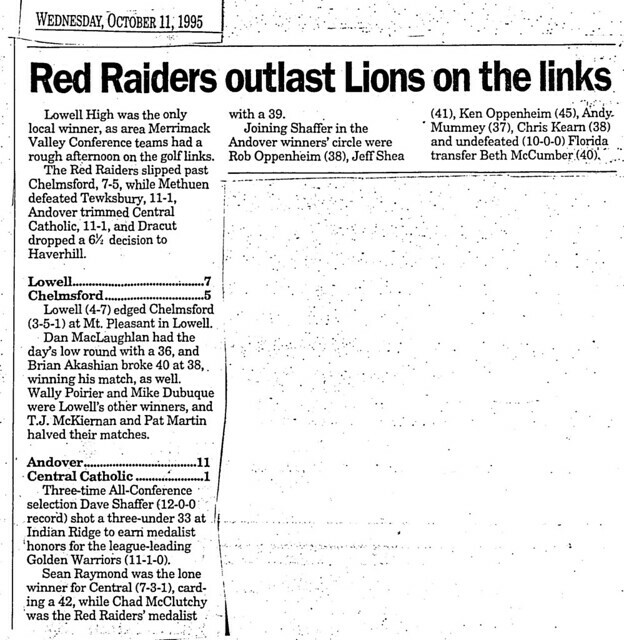 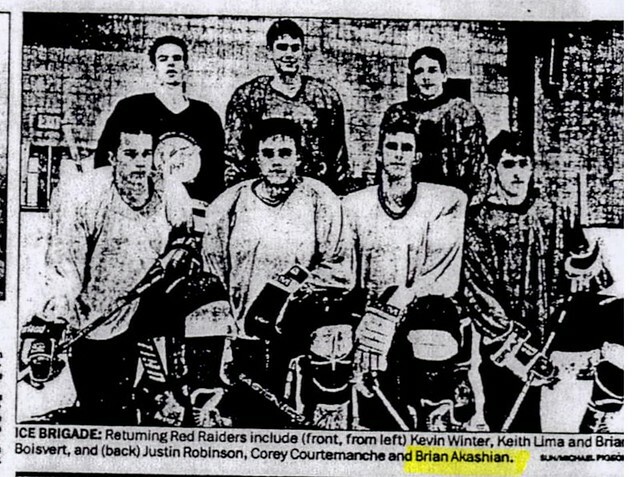 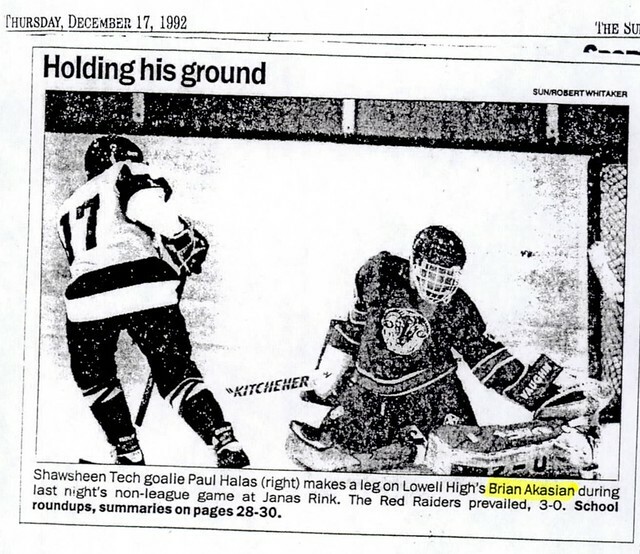 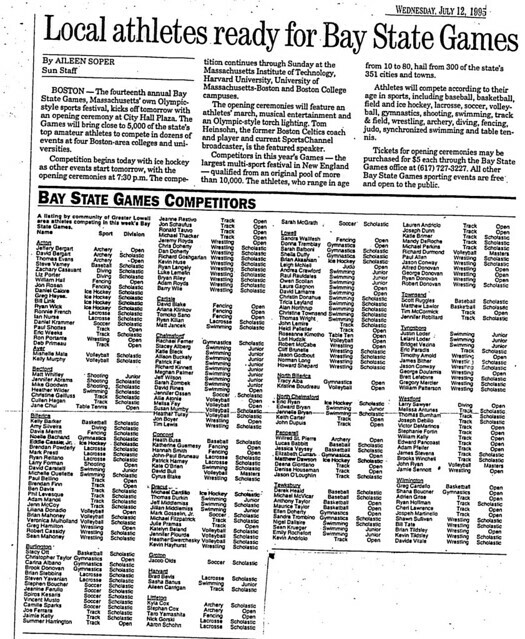 A 4-year varsity player for the Raiders, Brian earned Merrimack Valley Conference All-Star honors as a sophomore (1993–1994). 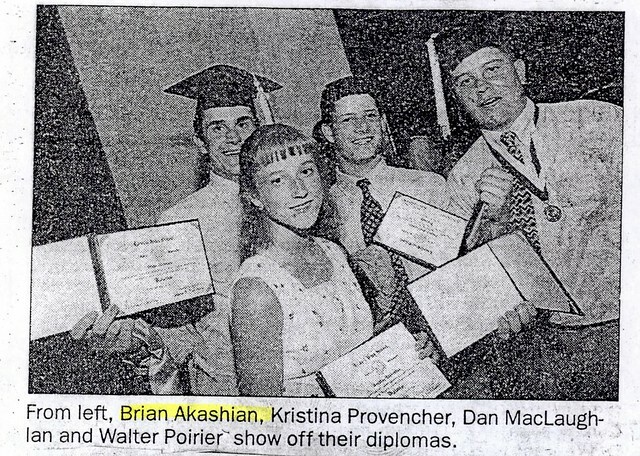 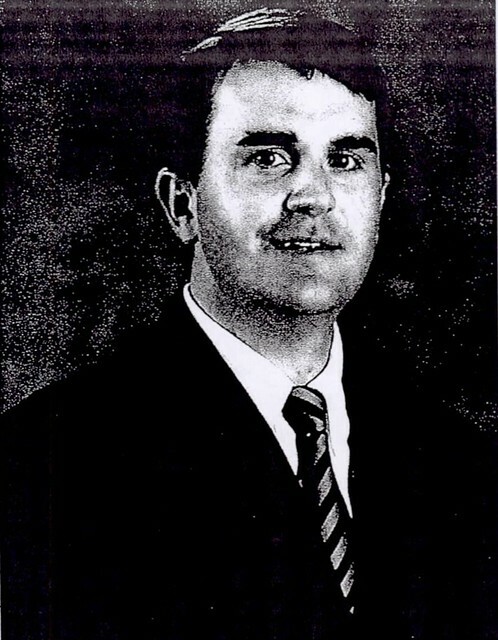 Brian blossomed during his junior year (1994–1995). 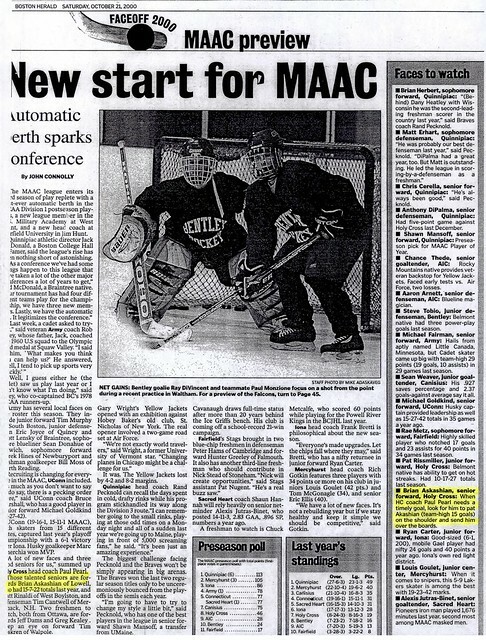 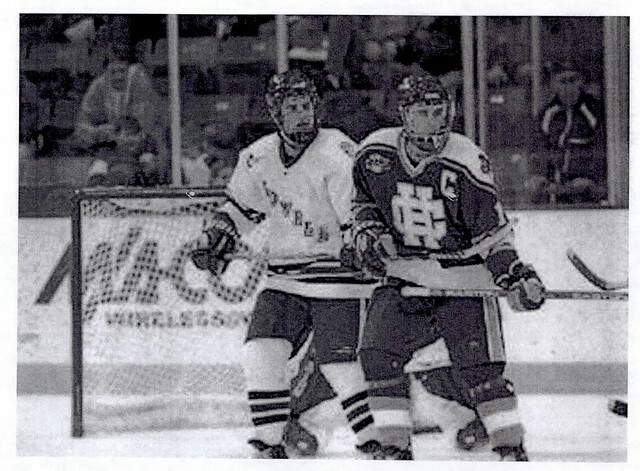 Serving as a team Captain, Brian became one of the premier players in the Merrimack Valley Conference while skating against traditional powers such as Chelmsford, Billerica, and Central Catholic. 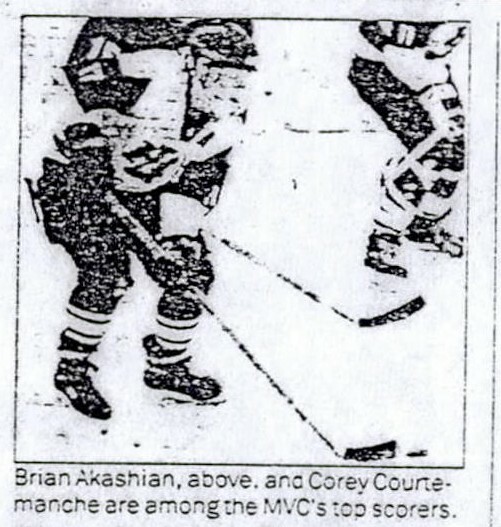 Rising to the level of the competition, Brian led the MVC with 30 goals and added 15 assists for a total of 45 points. 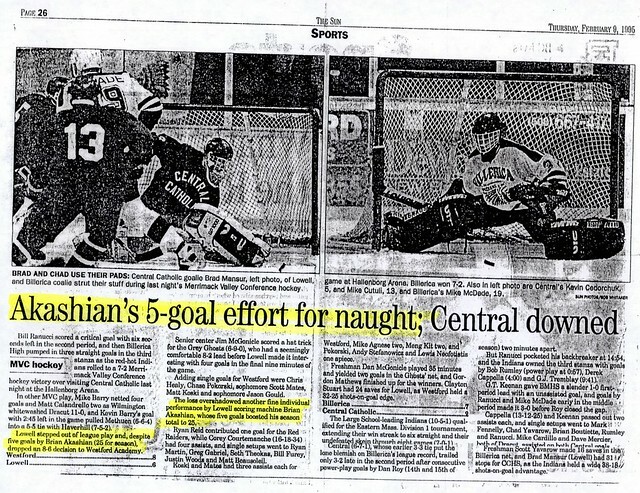 Among his highlights were a 5-goal outburst against Westford and a 4-goal explosion in a season-ending 6–5 victory over Dracut. 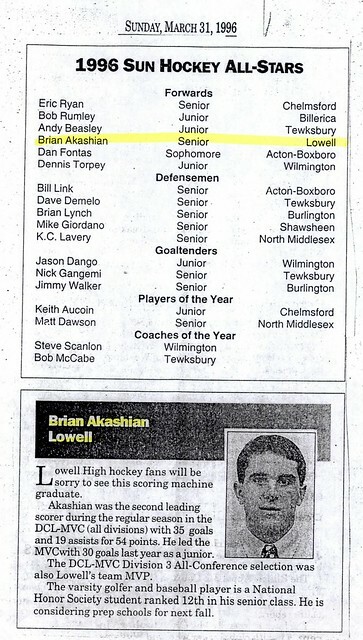 Brian won LHS MVP honors and was selected as a Lowell Sun All-Star and as a member of the MVC All-Conference team. 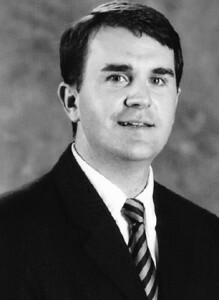 Brian continued his exploits as a senior (1995–1996). 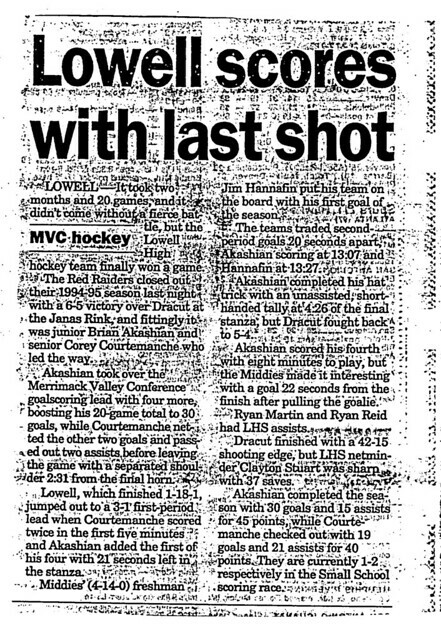 Team Captain once again, he tallied 35 goals and 19 assists for a total of 54 points, as he once again led the MVC in scoring. 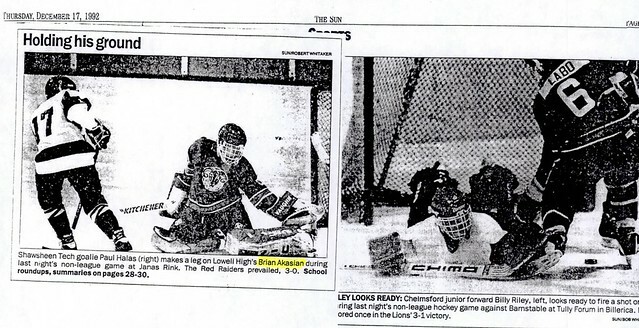 Brian’s seasonal highlights included a 4-goal 1-assist performance against North Reading and a 4-goal burst, including a “natural” hat trick of 3 goals in a 5-minute span late in the 3rd period, in a late-season 5–2 win over Dracut. 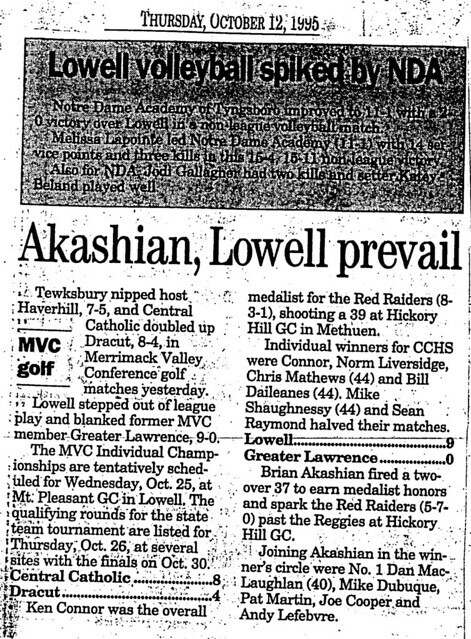 Brian reprised his post-season honors, again winning team MVP, Lowell Sun All-Star, and MVC All-Conference honors at season’s end. 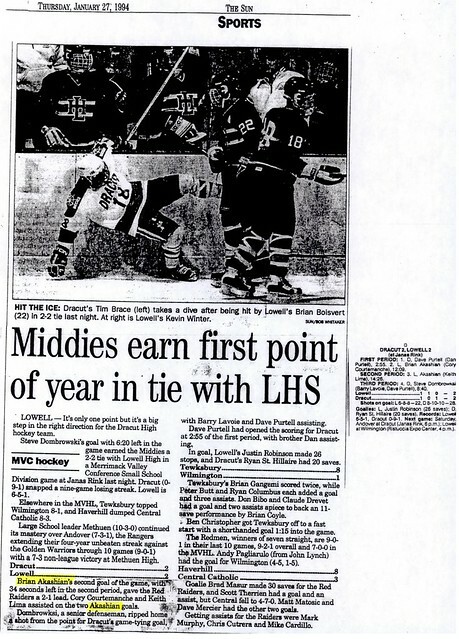 Brian completed his Lowell High career with 82 goals and 53 assists for 135 points, a school record at that time. 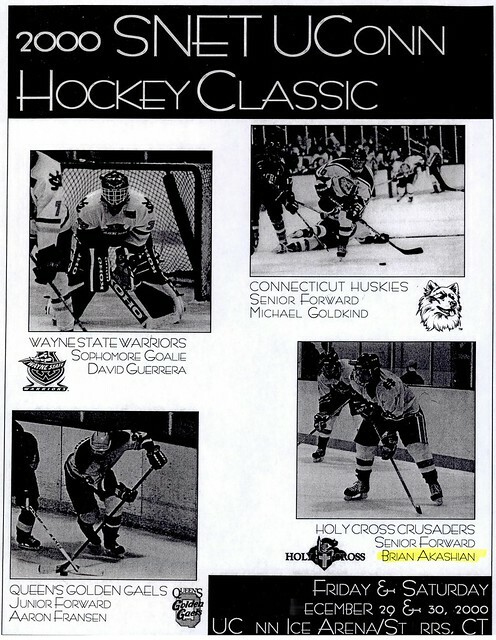 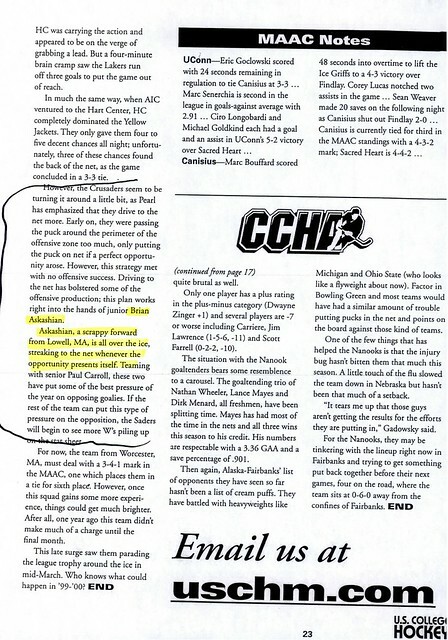 In the post-season Brian was one of only a handful of public high school players selected for the prestigious Hockey Night in Boston Showcase, where he skated with and against some of the nation’s finest prep players. 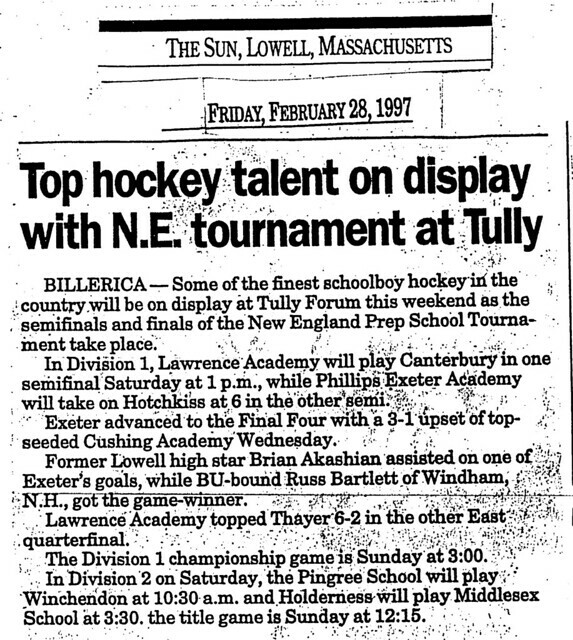 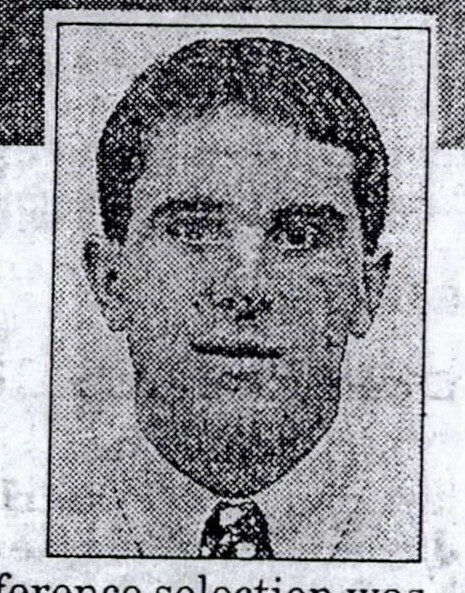 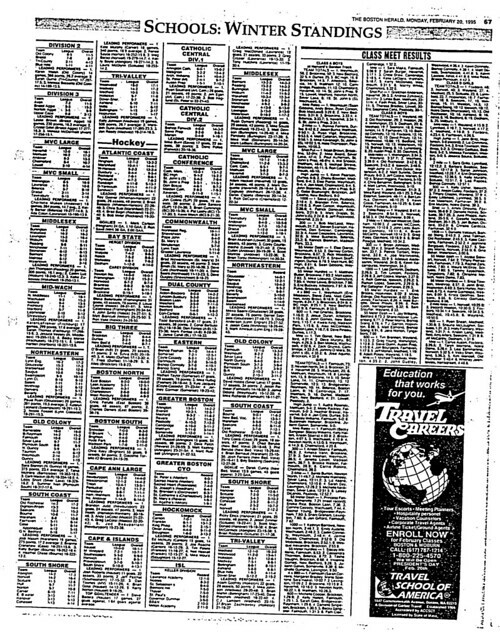 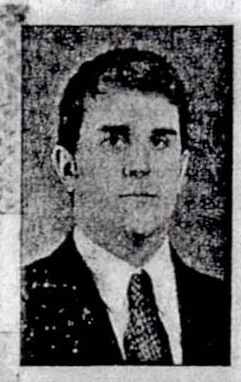 Brian attended Phillips Exeter Academy after graduation and led the Exeter hockey team to the finest season in its 78-year history. 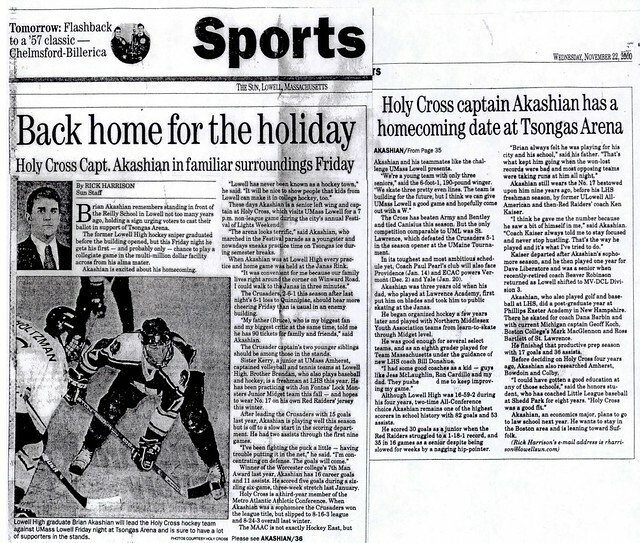 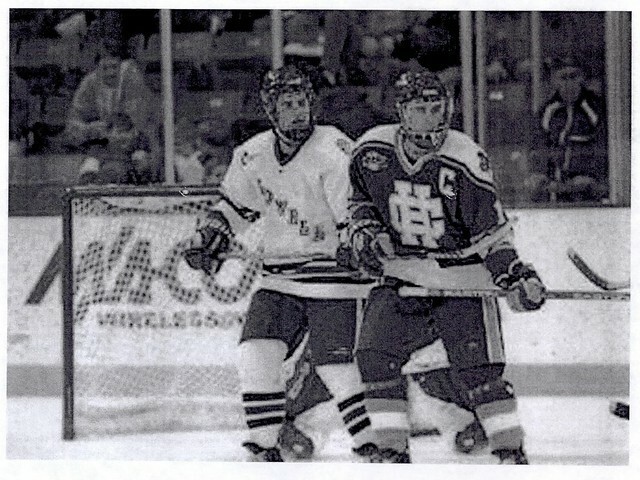 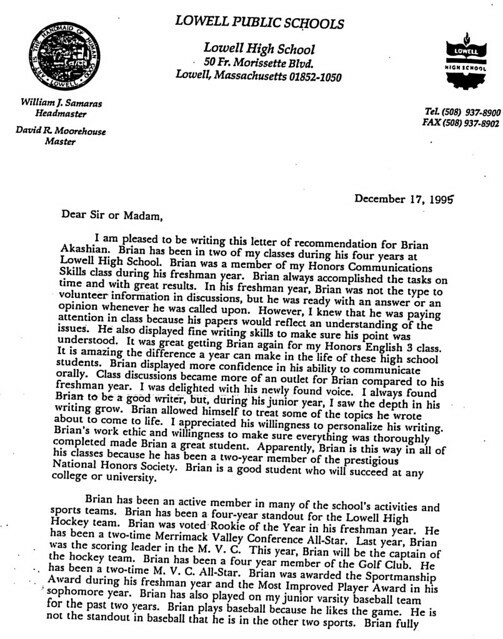 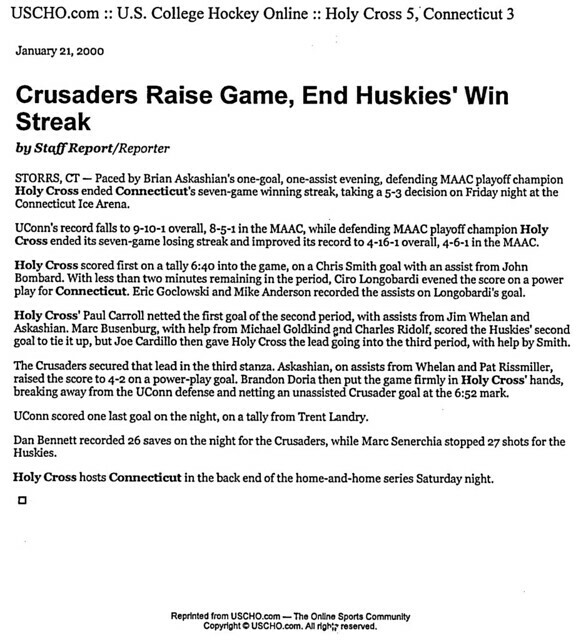 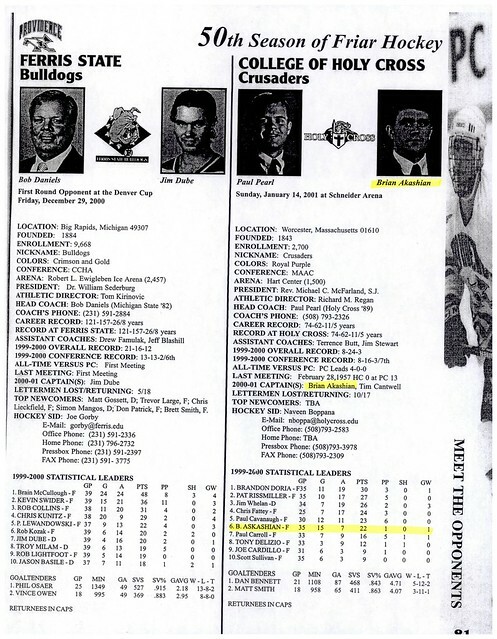 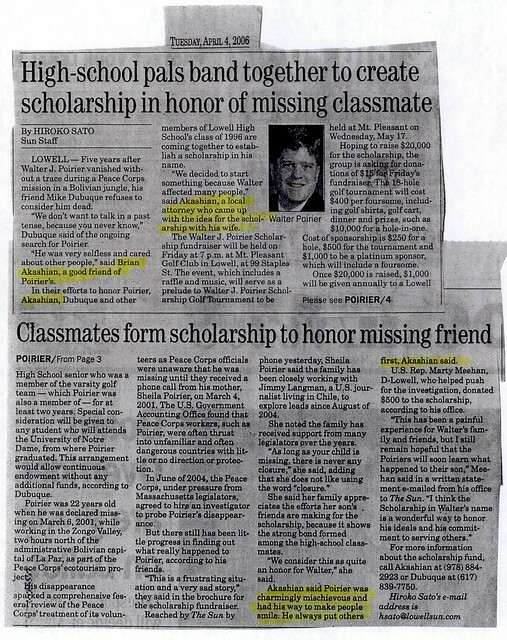 Brian enrolled at Holy Cross, where he became the 1st Lowell High School graduate to play NCAA Division I hockey. 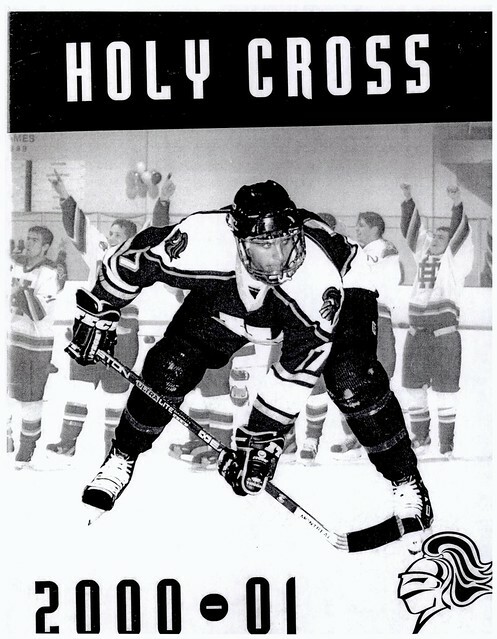 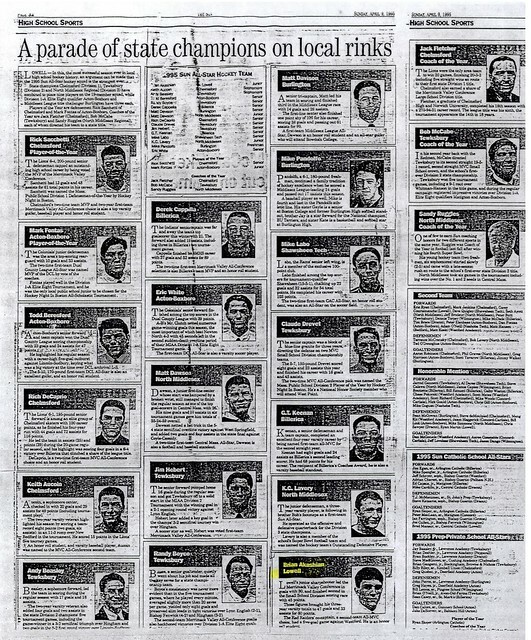 A 4-year varsity letter winner, Brian won the Crusaders’ Seventh Player Award (voted by his teammates for performance above expectations) as a junior (1999–2000) after leading Holy Cross with 15 goals. 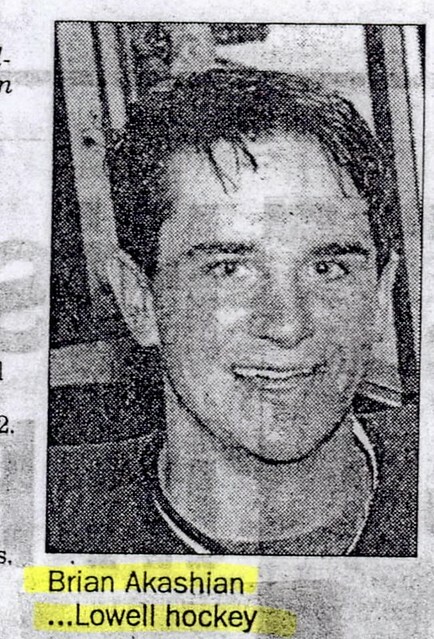 Brian was elected as team Captain for his senior season (2000–2001).